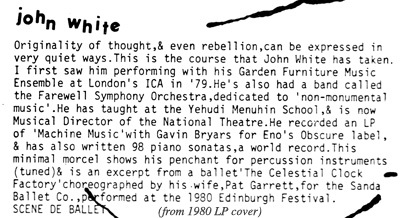 John’s “non-monumental music” – which I had the good fortune of hearing several times in various ensembles – was a great solace and inspiration for me during the chaotic days of assembling Miniatures and re-assessing my own music direction after an exciting but exhausting 12 years of drink-sodden rock. On several fondly-remembered occasions I found myself sitting in some tranquil, but adventurous London venue listening to long, spacious layers of notes from bands that often featured a combination of soft warm low sounds (e.g., tubas) and deliciously cool percussive high sounds (e.g. vibraphone, marimba). There was sweetness, modesty, spirituality and quiet English humour emanating from these minimal pieces – much like the man himself, who was invariably polite, warm and welcoming whenever we met. It was only later that I found out that John was continually, quietly beavering away at his record-breaking collection of piano sonatas (here’s #95). By 2010 he had written 175 of them (as well as 25 symphonies, 30 ballets, and a stream of highly eclectic incidental music for the theatre. His long and illustrious career (though I am sure he would never describe it as that) also included dashing off a collection of short pieces as background music for the Miniatures launch party, played by himself, fellow Miniaturist Gavin Bryars, and Dave Smith. The trio played, yes, quiet long low sounds and high percussive sounds – plus a spot of harmonium in the middle. This music has finally seen the light of day as bonus material on the 2012 reissue of my and Lol Coxhill’s “Slow Music” album. 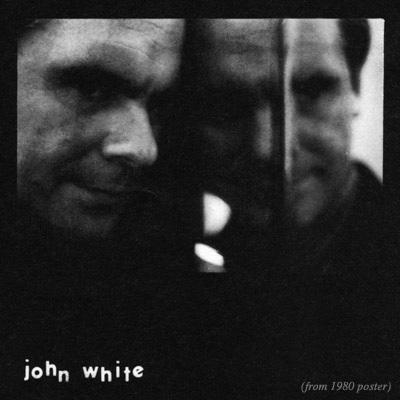 John’s early record releases include one of Brian Eno’s Obscure Records series, “Machine Music” from 1978. This delightful record includes “Drinking and Hooting Machine” where John, Eno, Gavin and others blow into bottles – a sound I have always loved and still experiment with in pubs. I have to say my favourite LP featuring John and Gavin is the sublime “Hommages” from 1980. Here’s a lush yet minimal piece entitled “My First Homage.” Once you have delighted to that, let’s go and visit the man himself, in his home. As always wonderful.You are a gift to our ears and our mind.